The planning for the 11th annual Texas Wine & Rogue Art Fest has begun! Mark your calendar, RSVP on our facebook event, and invite your favorite vendors. 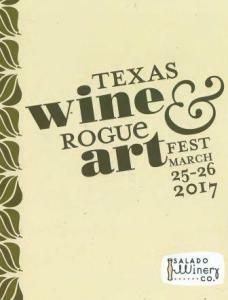 SALADO, TX – Enjoy wine, food, art, and the outdoors during the weekend of Saturday, March 25 and Sunday, March 26, 2017. You’ll find the charming Village of Salado filled with folks sipping wine, browsing art and nibbling on food at the 9th annual Texas Wine and Rogue Art Fest, the best wine festival between Austin and Grapevine. The 2017 festival will include wineries and vineyards pouring nearly 100 different Texas wines. The festival will feature wineries from all across the state, including Florence, Waco, Fredericksburg, Marble Falls, Hye, Pittsburgh and Lubbock. Wines vary from dry Mouvèdre Rosés and Texas favorites such as Tempranillo and Malbec to sweet peach wine and muscato. 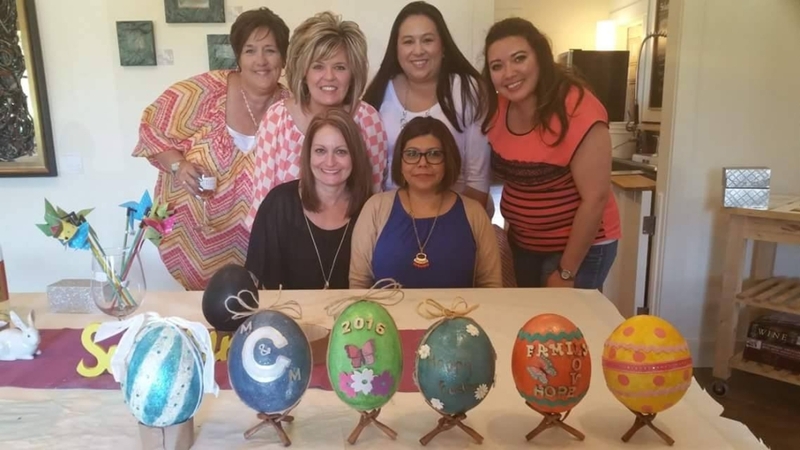 Some of your current picks like Fiesta and Chisholm Trail will be there and you may even find a fresh favorite in newcomers like Silver Dollar Winery or Kissing Tree Vineyard! Artists from across the state will set up shop at the festival selling handmade items. 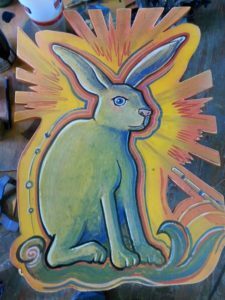 You can find anything from hand carved wooden pens to gemstone wine stoppers to welded horseshoe art. Some artists and vendors have been attending the festival for nine years, while new ones continue to sign up each year. Every year’s festival has its own unique set of gifts and art. If you’re hungry, the festival will feature several food trucks, including delicious wood-fired pizza by local favorite Fire Street Pizza, whimsically named pork sandwiches by at Hog Heaven, tacos by Salado native El Paisa #2, and snow cones (including wine-flavored ones for adults) by Southern Belle Ice House. Plenty of Texas food vendors like AustiNuts and Spicewood Food Company bring snacks, treats, and wonderful food that can be enjoyed at the festival or taken home with you. The full list of artists, food vendors, and wineries will be available at www.saladowinefestival.com. The festival will be held on the grounds of Salado Winery Co. & Salado Wine Seller at 841 N. Main St., Salado, rain or shine. Families are welcome! There will be plenty of kid-friendly space to run around, including Salado Winery’s cellar door sandbox. Well-behaved pets on leashes are allowed. Admission is free and $10 buys six wine tasting tickets and souvenir glass, with additional tasting tickets available to purchase. R. Coleman is color blind. The rules of art are elusive for him. Colors resist easy categorization. They deliver what the artist sees at the time of transition to the canvas. Some colors are adventures, some new sensations, some strangers. Some paintings have meaning within the presentation, for others the meaning must be found within the viewer. Every painting is unique and original. R. Coleman has been creating art in different forms his entire life. He works from his home studio in Central Texas. 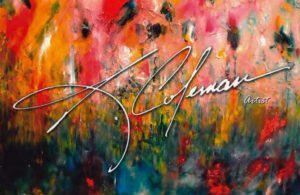 His paintings are in homes and private collections across the United States. Come meet the artist, hear his stories and enjoy. 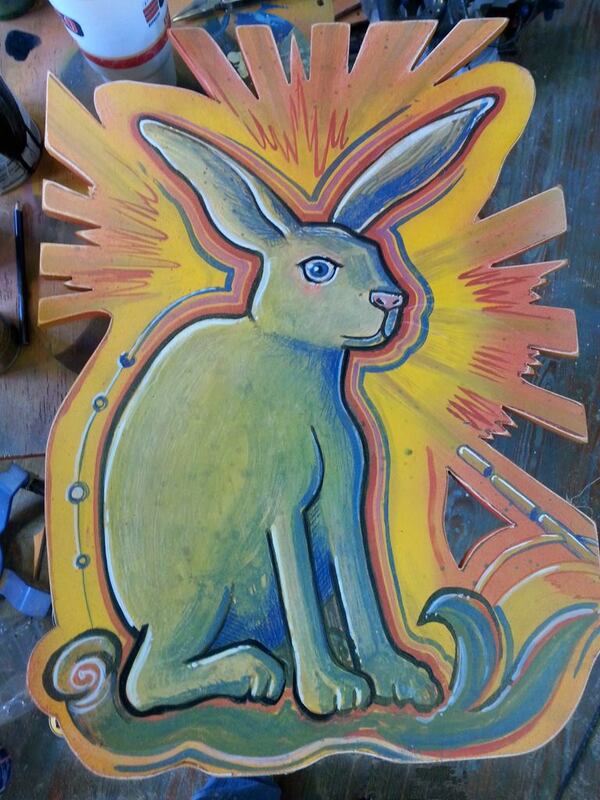 Art opening reception 6-9 pm, Saturday June 18. I love that Thoreau says “it’s not what you look at that matters, it’s what you see.” How I see is the greatest strength I bring to the work that I do. This also means it’s the biggest strength I can offer to our community. The 365 images that make up #documentsalado are a glimpse of how I see you, Salado. From the light to the art to the construction mess to the everyday views of local characters, this is what caught my eye as I did real life in our little Village over the past year. Each image was shot from an iPhone [No big cameras! That was my one rule. That and actually start and finish 365 images] then tagged and posted on social media so others could contribute as well. 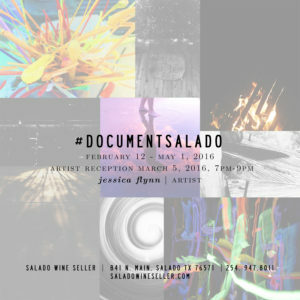 You can view the original project by following @jessijflynn on instagram or by searching the #documentsalado hashtag. Bring me something broken – humorous, significant, ironic, whateverrrrrr, just bring it. I’m going to collect it over the course of the show at Salado Wine Seller, break it some more and make another art piece out of our collective brokenness at the 2016 Edgy Art Show this coming spring. Especially at this point in our community’s story, it could do us all good to see something beautiful come from broken, chaotic, worn out, seemly random sh*t. Couldn’t hurt to try, right? Let’s just see what happens…. Many Thanks, Good People. Much Love. Hell Yeah. Hopefully #winerycat doesn’t knock over the tree! It’s officially fall! Join us on Saturday, October 10th from 1pm – 7pm when Patty Thomas will be on hand to discuss her newest artworks. She was selected for the next exhibition at the winery to showcase and celebrate Central Texas and the beauty of fall. Ms. Thomas, a Temple resident, studied art at the Texas Schools of Fine Arts in Austin and graduated with a degree in fine arts from Abilene Christian University. She has owned a graphic design company, painted furniture and murals, and sold her paintings in galleries. 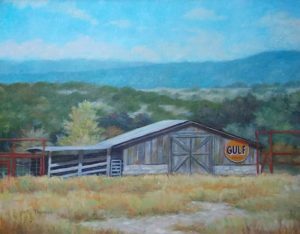 Ms. Thomas loves to paint Central Texas landscapes that highlight big skies, winding roads, and beautiful views of our area. As she puts it, “Today we seem to be caught in such busy, every-minute-filled lifestyles. 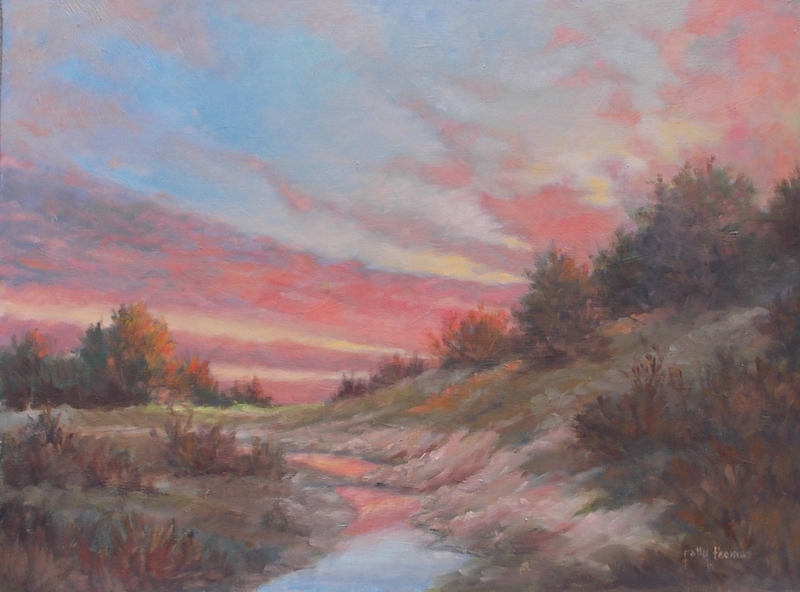 My paintings are intended to move us toward a calmer, less stressful pace for everyday living.” You can see her artwork at www.pattythomasfineart.com. The winery gallery will be filled with Ms. Thomas’s artwork, available for sale until the end of December. Of course, we’ll have plenty of wine open for tasting and savoring. We’ll also be debuting our newest release, the 2014 Big Bully. The 2014 vintage, a Tempranillo-Malbec blend, was grown in Temple and will be bottled earlier in the week. hop on by for a great summer evening! Art Opening Reception for John Davis, a visit from the gnomadic fashion truck, and an extra special wine tasting paired with some great food from Classic Events. A great summer evening filled with art, fashion, wine, food and of course, fun! “English is my second language after Art. I can express wordless ideas and places by creating them on a two dimensional surface. The illusion of the multi-dimensional world created on a flat plane is fascinating. Depth with all its mystery sparks my enthusiasm for creating space and filling it with artful shapes. Artists like Max Earnst , Claes Oldenburg and Dr Suess are inspirational to me as are Silver Age Comic greats like James F. “Jim” Steranko, Jack Kirby and John Buscema . Influenced by Richard Scary, Mad Magazine and Science Fiction my art has evolved into what I like to call visual stream of consciousness. In creating a piece, I want to fill the canvas with imagery and action to draw viewers in for close inspection that requires more than one visit. Using pencil, pen, brushes, spray paint and collage I encourage viewers to explore and discover personal messages via nostalgic icons of film, Americana or pop culture iconography”. In addition to meeting the artist, a special food and wine pairing will be offered. The food will be prepared by Classic Catering. The chef and his staff have carefully crafted a menu to pair with select Salado Winery wines. Tickets are available for $24.95 at www.saladowinery.com.